The first in an epic trilogy, Sea of Poppies is "a remarkably rich saga . . . which has plenty of action and adventure à la Dumas, but moments also of Tolstoyan penetration--and a drop or two of Dickensian sentiment" (The Observer [London]).At the heart of this vibrant saga is a vast ship, the Ibis. Her destiny is a tumultuous voyage across the Indian Ocean shortly before the outbreak of the Opium Wars in China. In a time of colonial upheaval, fate has thrown together a diverse cast of Indians and Westerners on board, from a bankrupt raja to a widowed tribeswoman, from a mulatto American freedman to a free-spirited French orphan. As their old family ties are washed away, they, like their historical counterparts, come to view themselves as jahaj-bhais, or ship-brothers. The vast sweep of this historical adventure spans the lush poppy fields of the Ganges, the rolling high seas, and the exotic backstreets of Canton. 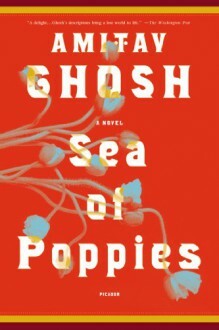 With a panorama of characters whose diaspora encapsulates the vexed colonial history of the East itself, Sea of Poppies is "a storm-tossed adventure worthy of Sir Walter Scott" (Vogue). 2.5 starsI concur with Jessica Hislop's review.